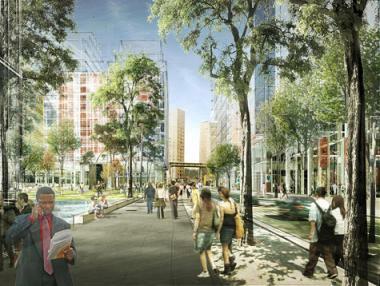 A rendering of Columbia University's Manhattanville campus expansion on West 130th Street would create a public plaza. HARLEM — A candidate for the congressional seat held by U.S. Rep. Charles Rangel is calling for an independent audit of the group that oversees the $150 million community benefits agreement that is a part of Columbia University's expansion into West Harlem. Vincent Morgan, a banker and former Rangel aide, has also asked Columbia University President Lee Bollinger to halt bidding on the first phase of the $6.4 billion project until the audit is completed. Morgan called the benefits group a "shell of an organization" that lacks transparency and accountability. He said he will seek a legal injunction against the West Harlem Local Development Corporation if it doesn't stop spending money and restructure the board. "The WHLDC has failed to form the semblance of a coherent agency capable of managing a complex CBA agreement, whose co-signatory is one of the largest and most powerful business entities in the city of New York," Morgan wrote in an Oct. 24 letter to the board. The agency is responsible for disbursing $76 million in cash and making sure Columbia delivers $30 million for construction of a new K-8 school in conjunction with Teachers College, $20 million for an affordable housing fund and $20 million in in-kind benefits. The WHLDC is also supposed to ensure that Columbia meets certain mandates for hiring local residents and minority firms for the 17-acre expansion of the Manhattanville campus. As it is currently constituted, Morgan said the group is incapable of accomplishing any of those goals. "Columbia has a moral obligation to not simply write a check and walk away, without assuming any responsibility for the conduct of the WHLDC and how these funds are distributed, but also to ensure that the underlying intent of the CBA is met," Morgan wrote in a letter to Bollinger. Several elected officials, including the Manhattan Borough President Scott Stringer, Assemblyman Keith Wright, Rangel and City Councilman Robert Jackson, have staff representatives on the board. The WHLDC has come under intense criticism for failing to act on its mission since the community benefits agreement was signed in May of 2009. Several founding members of the group have resigned and State Sen. Bill Perkins also resigned his seat on the board, citing a lack of transparency. Columbia University has transferred $3.55 million to the group so far and delivered another $10 million to the city's affordable housing fund. Of that money, the WHLDC has spent approximately $700,000, said Donald Notice, chair of the WHLDC. More has been spent on consultants to organize the group— approximately $400,000— than has been distributed in programming— approximately $300,000 to fund summer youth jobs. "When you have people who work for the elected officials, the elected officials have to be aware of the mismanagement and disorganization because they have high-level people on the board," Morgan said in an interview. Wright said that Morgan's criticisms were uninformed and politically motivated. "Just because there is a letter from Vince Morgan doesn't mean I have to get in a tizzy. He is not privy to exactly what' s going on and quite frankly I'm not up to speed," said Wright. "If there is a delay it's just a delay in terms of it being a fledgling organization." Rangel spokeswoman Hannah Kim declined to comment. Representatives for Jackson and Stringer did not respond to a request for comment. Notice refused to respond directly to Morgan's criticisms or address why the group has failed to obtain a headquarters, form as a non-profit, build a website or host a public meeting since its inception. The group, and its fiduciary agent, the Fund for the City of New York, have also declined to turn over records to DNAinfo that document its spending following Freedom of Information Law requests. Representatives for the Fund for the City of New York said they were a private non-profit and not subject to public records law. Notice said he felt the WHLDC had no obligation to release its records. Notice said that by the end of the year the WHLDC will have completed its transition to a 501 (c)3 nonprofit to be called the West Harlem Development Corporation. The new board will consist of Notice, former Community 9 chair Patricia Jones and current WHLDC board member Cecil Corbin-Mark. Elected officials will hold three spots on the board and Community Board 9 will have two seats along with other board members. Once the board is reconstituted, they will hold public meetings and develop a process for applying for and distributing grants will be in place, said Notice. The group is also in the final phases of negotiating an up to 10-year lease on a property within Community Board 9 and has also hired a company to vet executive director candidates. "I know the community is concerned but we want to make sure it is set up right and that the infrastructure is in place," Notice said in an interview. "It's not like we are sitting around." This summer, the WHLDC gave $300,000 to the Department of Youth and Community Development, a city agency, to fund 200 summer jobs for kids in Community Board 9 through the Summer Youth Employment Program. DYCD recently requested $1 million per year from the WHLDC for seven years to run after school programming, but Notice said the group is not interested in funding that proposal. Funding the summer jobs program was "the right thing to do," said Notice. The board felt comfortable funding the request because the jobs program is well-established. Morgan said the disbursement was illegal because the group has not been "configured into a final legal entity legally authorized to disburse these funds." Larry English, former chair of Community Board 9, said he did not receive any notification that the WHLDC would be disbursing money. To distribute funds without notifying the public by issuing a request for proposals is "highly inappropriate," said English. "Who would question giving youth jobs, but the intent is to give the community an opportunity to decide how to use those funds, not allow a few individuals and politicians to make those decisions," said English. By not having any public meetings, the group is violating open public meeting laws, said Morgan. By not having a transparent process for handing out funds, the group is violating the public's trust, he added. The public also has no way of knowing if the board members are qualified to handle the financial, development or construction management issues that the WHLDC is going to face, Morgan said. "We need to get some reasonable managers in there to allocate this money appropriately or you will have city agencies saying we have a budget shortfall, let us manage it," said Morgan. Wright said there is no "malfeasance" at the agency. "These are good community people trying to do the right thing," said Wright. But he also added that he was not in favor of the idea of the group using the money to fund city programs. "I am not aware of that. Hell no! Mike Bloomberg doesn't need any more of our money," said Wright. Columbia University spokeswoman Victoria Benitez said the university was unwilling to "comment on a candidate’s platform," but noted that the "development corporation is legally and operationally independent of the university." However, Columbia has assisted the WHLDC upon request, she said. "Columbia has been and remains committed to fulfilling its obligations under the CBA so that West Harlem continues to benefit from the University’s long-term investment in our local community," Benitez said in a statement. But after years of inaction, Morgan said something must be done now. "Enough is enough. I would like to see them stop spending money and have an independent evaluation," Morgan said. 'It can't be done with elected officials in the room."